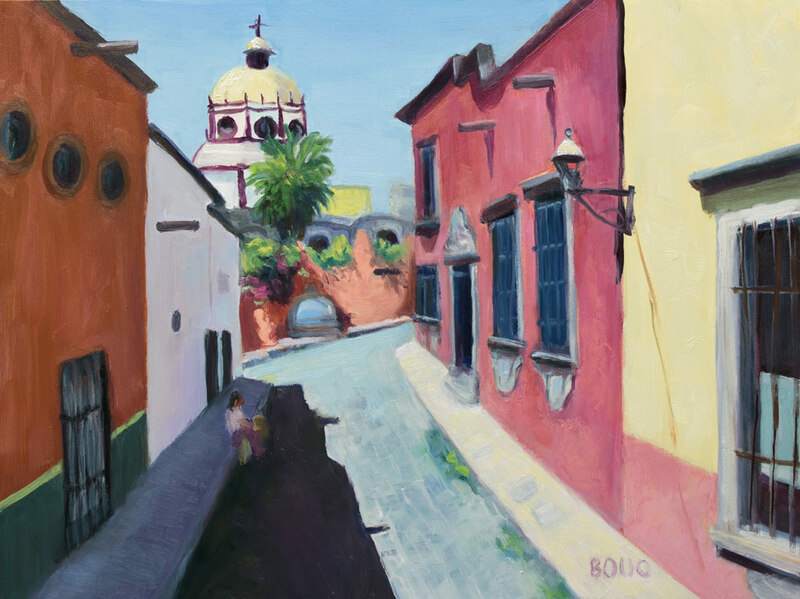 It was so wonderful traveling around sunny San Miguel Allende, Mexico (virtually via Google street view and my paintbrush!) while it was cold and rainy here. I tried “driving” around to find the church at the end of the road, but just like I do with real driving, I got lost and never found it. Once I’d adjusted the image in Photoshop to straighten the walls, crop to 9×12″ and warm the color a bit, I used the “gridding-up” method to create a drawing first. I displayed the image in Photoshop using”View/Show Grid” set to overlay a tic-tac-toe like grid). Then I drew a matching grid on my paper and started drawing, one square at a time. Using the grid makes it easier to accurately see and draw the shapes in the image, section by section. Drawing first instead of going directly to paint helped me to understand what I was seeing and to notice interesting patterns like the pipes sticking out of the buildings and the circular motif of the windows in the building on the left as well as the church in the distance. What a gorgeous little town! I’d love to visit there sometime! What a nice antidote to a rainy day! You found a beautiful scene and made it yours! I love the strategy you used to draw and paint. Lovely results. I’ve visited San Miguel de Allende and it is incredible. I highly recommend going. Some very nice fresh passages here, and a beautifully chosen scene. The diagonals really pull it all together. Lovely colors, vibrant paint strokes. Frank Gardner lives there and paints many many scenes of the town, all of them very nice. You’ve totally captured the essence here. If you ever go there for a workshop (wonderful artsan shops) , be sure you manage a side trip to Guanajuato! What a beautiful place it is indeed! Lovely painting and San Miguel looks just like this!